This is my first instructable and I am victim of a malicious destruction of personality and property as well as an assault with intent to maim, murder and unreasonably serial kill experience forensically clean worse I think than the U.S. Diplomats, Staff and Family experienced in Cuba and other Embassies other than what I've read and watched regarding Moscow starting in the 1950's and in the modern era there and in the U.S. The brain is even defined as the 21st century battlescape by one of the worlds leading neuroscientists involved with investigations. I know some of the modern era technology is hard to believe if you don't have a background regarding. Keep in mind experiments were performed in the 1700's and 1800's by Volta, Aldini and Ure to better understand the electrostatics and direct current (DC) effects observed with living systems of the era. For the period in history the experiments were more to demonstrate to inspire others to inquire further to understand the phenomena that was more of a parlor show of the era. Later, J.C. Bose, Pyotr Lebedev and others demonstrated that there was more to the parlor show application and phenomena in higher frequency ranges to be observed and reported to bridge the gap from DC to the newly found X-Rays and Gamma Rays known at the time though not well defined. However, just as Galvani tried to demonstrate to Volta where Volta voiced "serious reservations"... today there is skepticism, controversy, and rejection as with sonic and ultrasonic weapons that are clearly demonstrated as dangerous. Even so, the "mass hysteria" "as a plausible alibi" is the norm until proven otherwise like by those who have performed Bio-Sensing in fun ways or by those that even know the acoustic microscopic capabilities and ultrasound resolution capabilities. I'm still wondering why some want to act like the satellite cell phone doesn't exist and everyone still uses telegraphy with no multiplexing or modulation from the 1800's and earlier??? Think of the human body having organ, tissue, cell and molecular structures with frequencies that resonate like antennas where there are receivers and transmitters involved with the term that was coined at one time... "animal electricity" effects going on. We've all felt the electrostatic effects on our bodies before in a static electricity shocking way. That was a DC low current effect on our nerves. We all know the most obvious receivers used for our bodies to input information are our visual, hearing, smell, taste and touch senses. Those senses are more a biochemical DC with electromagnetic alternating current (AC) properties associated. The AC can be studied as a electromagneticfrequency (EMF) in the radio frequency (RF) range typically or elsewhere in the electromagnetic spectrum (EMS). Information in the form of memories and associations of memories, that may be obvious also as processing input information, are stored in an analog and digital way like how a computer does albeit biochemical with associated EMF processes in the RF range and maybe other frequency ranges in the EMS. Those would be the input and processing functions of our biochemical-electromagnetic machinery to perform mechanical and other sympathetic nervous system functions as outputs based on the information input and processed. The body also performs processes from autonomic and parasympathetic nervous system information too. How others can tune into our bodies processes using sound and EMF, like may be how MALINT works, is much like how we turn on a radio for information and tune the radio to a radio station to get the audio response we need for the information we want to hear. More accurately describing would be like a ham radio tuning into a repeater and sending a code to have the repeater perform a function and further transmit signals we want to communicate to others so others have the information to respond to. Some of this tuning is known, such as Electrographic modalities by body part, and is taught in even high school level courses in regards to body senses say for example hearing via bone conduction and nerve conduction of sound waves. In regards to primarily direct nerve conduction with EMF waves (not the bone conducting pressure wave) Dr. Patrick Flannigan has disclosed with the Neurophone how this human body process is performed. Dr. Robert O' Becker also discussed entrainment in his book's like The Body Electric. The complexity of alternating current and direct current appears more complex as we study radio frequency more and become aware of the analog and digital components of the communication systems because the systems are complex though understandable as we learn more information regarding the inputs, processes and outputs relating to the environment, boundaries and internal system being studied. The same is true with the bioelectromagnetism of the human body and the associated biological effects. Electroporation is documented with specific threshold values. However, analogous electroporation effects of wireless devices capabilities are not. There isn't much for information regarding the higher frequency range in the main stream media other than in Soviet literature and sparse reports in alternative medicine. However, there are reports of directed energy weapons if not used within a criteria being dangerous and I'd guess lethal. There is a little information that suggest the high frequency ~95GHz active denial system can be potentially lethal also. The NIR ranges seems to have some info like the ultrasonic range regarding the window in biological tissue. Therefore; in regards to what we are learning, I have been through and we need to learn to detect and shield from... feel free to critique this instructable as I am considering this a work in progress that I am most likely going to break into easier to comprehend separate instructables in the near future. Regardless of the situation; I am passionate, optimistic, and really excited about the project I am about to share regarding how to make a directed energy weapon detection system for less than $50. Assuming you already have a microphone, computer and materials to make an antenna including the feedline... this project may only cost the amount spent on the RTL2832U, DVB-T Software Defined Radio (RTL-SDR). That means this project can be completed for less than a $25 investment for a high quality RTL-SDR or less than a $10 investment for a mini-DVB tuner RTL-SDR. If you want a lower noise floor system by using the SDRplay the project might be less than $125 and if you want a wider frequency range system for down to DC and further into the GHz range... the system can be made for less than $300 by using a HackRF or other SDR device along with an upconverter and/or downconverter. This is another upconverter by SV1ANF that can be made since he has schematics available or can be purchased. Potentially the $25 or even more cost effective RTL-SDR can be made since open source and/or improved in performance using some skills you may have or by learning and applying some new skills. Learning the basics of antenna theory, matching the feedline and antenna to the 50 or 75 ohm SDR, how to make antennas from salvaged materials and tuning antennas is going to be very valuable in lowering costs and improving your detection capabilities. There are plenty of great websites and instructables that can be found with an internet web browser search regarding how to construct your range of antennas that are optimal for the frequencies you want to detect. Joining a Facebook (SDR, Antenna, Radio, Electronics, etc. related) group, an ARRL Affiliated Amateur Radio Club and/or earning your FCC Amateur Radio Operator License is a great idea also since many clubs have almost free classes where you can learn more about Amateur Radio and Radio Frequencies (RF). I recommend buying some books regarding what there is to learn as well as joining a club to advocate and perform "Fox Hunts", also know as Radio Direction Finding (RDF). RDF is great to read into for sport and optimizing antenna designs and detection procedures to be directional for use in determining sources of static, noise, interference and/or jamming. Static, noise, interference and/or jamming are the general technical terms in radio lingo for issues with reception or transmission. Some military radio manuals even note to contact JEWC, or nowadays JEWC is reported to be realigned into JIOWC, if there is a static, noise, interference and/or jamming issue. Learning electronics, if you haven't started yet, will help save you even more money since you can salvage electronics components to re-purpose. The salvaged electronic components can be used to make an upconverter and/or a downconverter and/or other modifications and/or circuits for the detection system including the SDR. Learning how to use older super heterodyne receivers or scanners as antenna feeds so you can connect a feedline from the antenna input of the RTL-SDR, or whatever SDR you have, to the super heterodyne receiver or scanner discriminator IF section of the circuit will improve performance also. Learning cooling methods will help increase the life-cycle and performance of the systems as well. Learning where to salvage those cost effective related components in some cases (Craigslist, Offerup, Letgo, etc.) for the expense of going to get for free will save money. Learning shielding of the system components and shielding the complete system will also improve performance. Again, as already noted, learning how to salvage, recycle, re-purpose and re-use those materials will save money and be an adventure in itself. Pretty much most old TV's, computer power supplies and radios will have components and materials you can re-use or re-purpose. From what I've found, the better brands will have better quality components. Desoldering also helps refine solder skills. A really cost effective $7 electronics component tester, called an LCR meter which stands for Inductance (L) Capacitance (C) Resistance (R), for testing salvaged components can be found online. I've been a victim of, what I've concluded to be, remote sensing and transmission ElectronicSurveillance (ES), Technical Surveillance (TS) and more advanced ELINT/RINT or some sort of intelligence disciplineElectronic Warfare (EW) weapons systems since I can remember starting in the early 90's. Prior to that period I was a budding scientist with interests in the range of sciences thinking I'd be an astronaut when I get older or at least a rocket scientist. That wasn't the case when I realized conflicts that have occurred throughout history and for generations were going to disrupt and corrupt my innocence with brain washing, mind control and cult programming via narcotics and dangerous drugs poisoners who also used and still use remote sensing and communications devices that can transmit sound anywhere around their victims to maliciously lead for continuing criminal enterprises and other racketeering activity brain washing, cult programming and mind control. Even activity in official positions that Internal Affairs, Office Inspector Generals and other special operations groups expose on a regular basis in some departments and offices. I recently found the DHS is the worst performing of all the U.S. law enforcement agencies. Beginning in 1998, I didn't notice an issue with the transmissions communications remotely intense until around 2008. Around that time I started hearing sounds in my perimeter that were people speaking to me that were layered and blended into the ambient conditions sounds if not directly out of thin air from locations that seemed plausible like a ventilation shaft duct. A shaft and duct that were literally removed from my office since those who I had complained to seemed to think like I did at first in regards to people literally talking down the shaft where there was an opening in a different department. Then the voices came through the walls and when I didn't find a plausible source that was easily correctable... more than issues from voices began to occur... body assaults started that caused pain, choking, breathing issues, G.I. tract upset and other traumatic events like noted by others online and on this website's Electronic harassment and electronic torture list. I'm not certain the causation(s) in my case. I did notice consistent perverse sound assaults starting around the time of my publication of my NIR Novel Tool work in the October 2008 edition of American Laboratory. Those sound assaults turned into body assaults and mind control like noted on the device page of Lonestarconsultinginc's website. In particular like noted with the Scanners - The Device or the The ULTIMATE WEAPONS & LAB DEVELOPMENT SYSTEM. I had also worked on assessing, designing, installing, operating, qualifying, documenting in technical documents, training and/or holistic systems validated implementations of FT-IR microscopy, NIR hyperspectral imaging, Terahertz Imaging, Rapid Bacterial Detection, Handheld Raman & NIR ID, Coordinate Measuring Systems and/or other alternate technologies for analytical quality systems functions. Coupled with the analytical methods understanding, I had researched Medicinal Chemistry since I wanted to be an N.D. and have an awareness of Quantitative Structural Activity Relationships (QSAR). Back in High School, I had made the association of spectroscopy peaks maybe having something to do with aiding reactions since the chemical entities had some molecular energy associated with those peaks. Microwave spectroscopy deals with predominantly Rotational Energies of molecules rotational transitions. 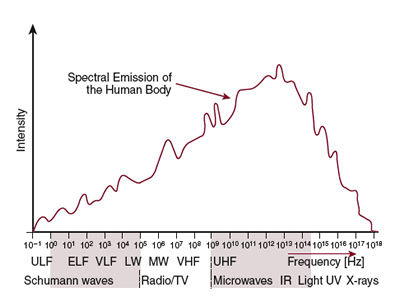 Infrared spectroscopy deals with predominantly Vibrational Energies of molecules vibrational modes. UV-Vis spectroscopy deals with predominantly Electronic Transitional Energies of molecules energy level transitions. NMR spectroscopy deals with predominantly Nuclear Magnetic Resonance Energies of molecules magnetic moments or transitions between nuclear spin levels during resonant RF irradiation. There are other forms of spectroscopy like Electronic Spin/Paramagnetic Resonance that deals predominantly with Electron Energies of molecules magnetic moments versus the atomic nuclei as with NMR. Therefore, my theory is that the human body or any living system organs, tissues, cells and molecules can be hacked into based on predictable, calculated and experimentally adjusted known resonance frequencies based on fundamental nuclear, electronic, magnetic, rotational and vibrational states moments and transitions energies and frequencies. Thus, many medical conditions can be improved without the need for medications other than for limiting nutrients intake. Conversely, many if not all medical conditions can be created from remote sensing and transmission stations directed energy weapons operations. Thankfully, that background has helped me explain the issue more detailed I'm finding. Where others seemed to be reasonably afraid to even discuss in detail, not as mentally capable or committing treason by aiding and abetting if not co-conspirators performing disinformation. I knew, and know, from my USDA, DHHS and other regulatory agencies training that whomever was operating the directed energy weapons system was in violation of the spirit, intent and letter of the Constitutional and Statutory Law of the U.S. Jurisdiction, Geneva Convention and even International Courts. The victims need, myself included, an advocate of the truth to save our lives and I wasn't going to let anyone down I can communicate with... even if I have to learn and re-learn skills along the way. I hope and have faith you have learned something new already from just the description in the introduction section of this instructable. Here is to the best of my ability my first instructable regarding how to make a Directed Energy Weapon (DEW) Detection System for less than $50. Feel free to question, comment and/or suggest anything that comes to mind to improve the systems capabilities and performance. As I noted in the Intro section, there are many ways the DEW Detection System can be implemented. We're going to make one of the less than $50 DEW Detection Systems described in the intro. The flowchart shows a basic process to follow that will be demonstrated in this instructable. The basic system consists of a computer with a microphone (built in or if external, an audio system with inputs are required), an available USB port for the SDR, an SDR, optional USB extension cable (to keep the SDR away from the computer to lower noise from computer), feedline (can use stock that came with the SDR or purchase or make if need to place antenna in a different location), connector adapters (if needed for the feedline connection to the antenna and/or SDR) and antenna (can use stock that came with SDR, purchase or make a improved band specific range version). Also, you will need an operating system that supports the hardware and of course the software you choose to use. Furthermore, you will need the software for the SDR and audio recording and/or viewing if not installed with the operating system you are using. Technically, since I can't afford the new $1.3 million dollar 100Ghz Oscilloscope from Keysight or a comparable system from LeCroy, Tektronix or Rohde & Schwarz... we'll stick with what most can afford to see a Fast Fourier Transform (FFT) of the EMF signal causing the sound, body and/or mind control assault. What most can afford, to see the FFT of the EMF signal if in the Electromagnetic Spectrum (EMS) range of the RTL-SDR causing the assault, is an RTL-SDR. I added some copper foil tape around the outside of the case to help better shield the tuner from noise if you noticed in one of the photo's. So technically, if you have the computer system with audio and aren't even savvy with salvaging and maker skills, you can build a DEW Detection System for less than $15. Later I invested in the RTL-SDR.com V3 from rtl-sdr.com and the Nooelec SMArt from Nooelec. Going with the better quality RTL-SDR, you can build a DEW Detection System for less that $25. Most recently; I invested in a mini-DVB tuner that came with an antenna on eBay for $3.99. This means you can build a DEW Detection System for less that $5. Be sure to read the different tool specifications and compare those to be connected before plugging together so you don't damage your tools. Assuming we know how to use a computer, have access to or already own a computer, we will need to install the required applications for the operating system (OS) we are using on the computer if they are not already installed. Technically, we can use a LiveCD, LiveDVD or LiveUSB also if all the software applications are installed with the OS. I am not going into that level of OS installation detail in this instructable, though this route can be considered in the future using Kali Linux, Skywave Linux, Andy's Ham Radio Linux or a custom Linux Distro build of your own that has all the software required to detect DEW's is installed. In this instructable I will discuss my experience with the Linux and Windows OS's. First print out, or have open, the Generic Procedure for installation of RTL-SDR software on Linux (I used Ubuntu 17.04) and Windows 7 Pro SP1 and install the software on your computer you are using. Now that you've learned how to make a DEW Detection System; it's time to read more into how to operate the system, optimize settings and select equipment better suited for your specific environmental conditions. Read through the help sections of the software applications, search online for websites and videos to teach how to use what you are using if you are not familiar with learning how to use the specific software of your choice. Using software comes easy for me usually since I grew up using computers and my second Bachelors of Science is in Computer Information Systems that was originally Systems Analysis and Application Development that later changed to a emphasis on Programming. I tend to play around with the software until I get a feel for how the applications work intuitively with some reading into various sources of info as I noted previously to answer questions I have or regarding issues. I usually just search online for the answer to the issue I'm having or questions I have. Besides the hardware noted in the Generic Procedure, I've used a Microsoft Lifecam Studio and a Logitech C920 HD Pro to record the audio and any quality microphone can be used. These better microphones can be found at the Goodwill Store, Habitat for Humanity ReStore, other thrift shops or Surplus Stores for in the $1-10 range depending on in store sales, if not purchased online, for under $50. I started off just using the cheap microphone that came with the Windows XP computer I was using at the time when I first noticed I could see the DEW sound assault in the sound meter when Microsoft Sound Recorder was opened. I also recorded the sound assault using the built in microphone on an older X200 tablet I used to have that was stolen in another incident where I almost lost my life. I observed a frequency hopping Tetra system looking signal hoping around ~820MHz with the sound. There are even applications that can be installed on smartphones to detect and record the audio and RF signals that are free or for a small price. I will not go into that detail with this instructable unless suggested. There are resources that detail how to make a smartphone system online that can be searched and read or watched. I have two apps that detect the sound called SpectralView and Noise Meter installed on my phone. There are a few RTL-SDR applications for Android... though I haven't used yet and they require an additional cable to interface. I found being on a computer made recording the sound, say in a raw format like a .wav or .wma file just using the Microsoft Sound Recorder, easier and easier to open in a audio processing and analysis application like Audacity. There are oscilloscope applications that can be used that use the sound inputs from the sound card on a computer in a different way than the SDR. However, from my experience there isn't as much information gained from using the sound card oscilloscope applications compared to the Spectrum Lab and/or the Audacity software which have similar functions and many more. The Spectrum Lab software is the best I've found for free for audio and even SDR input detecting. Audacity is the best I've found for free for audio processing though technically you can connect an antenna and record directly into any recording software like Audacity. There may be more ways to process the audio like changing the sampling rates that I forget the details at this time due to the trauma inflicted from many continuing criminal enterprise incidents and not just the gun shot wound and poisoning incidents. If you didn't already know; an antenna can be connected to the line in, or microphone input, of a sound card keeping in mind to make sure the impedance (really basically speaking, that's the ohm in AC like resistance is for DC) is matched, the signal strength isn't higher than the input limit on the line in or microphone input, the length and the design for optimal SWR of the antenna for the frequencies detecting is optimal for best reception. The length of the wire is important for optimal reception with either a long wire antenna or a magnetic loop antenna (mag loop for short) as noted in the picture from a ARRL Handbook. Please share and support this effort as well as encourage others to support this effort to make a healthier, safer, fair and well being World free from forensically clean malicious assaults with DEW's. As noted in the Introduction section, there is a lot to learn to cost effectively improve the performance of your system if you haven't learned already. The first thing I did, beside reading a lot of whatever radio related books (like ARRL's) I could find from the Library Inter-library Loans and online, was invest in a discone antenna along with some cable and connectors that can be seen in the photo. These can be found for under $39 dollars or made from salvaged free or really cost effective materials like copper wire/pipe, aluminum wire/pipe or aluminum ski poles. Here are some links regarding the discone antenna; the discone antenna wiki, an instructable regarding how to make a discone antenna, a folding discone made from wire and an interesting discone design that I haven't tried yet though found at the bottom of the link an interesting coincidence that I wonder if is related in my U.S. Jurisdiction and maybe a causation for the ongoing forensically clean, to most that don't do their job in forensics, assaults with intent to maim and murder. For my first "Fox Hunt" to detect a transmitter of a known frequency, I just used a modified procedure noted in "Handie-Talkie Tricks" and seen in the photo that consists of a powdered milk can with a 325 stainless steel screen cut to fit inside the lid, some shop towels to pad the radio that was placed in with the antenna removed. At first I just used the walkie-talkie against my chest method until I was closer. When I was close to the transmitter, like maybe 20-30 yards from, I set the antenna to the third harmonic since I was using a cheap Baofeng UV-82 that isn't a superheterodyne radio. The Baofeng's are an SDR technically with auto-gain settings that are noted in the homingin.com article regarding "Offset Attenuator". If you want to be able to fit the RTL-SDR or other SDR detection system into a can, then this type of system can be made using an ASUS Tinker Board or other microcomputer instead of using a laptop. Next for RDF, I started working on a portable telescopic yagi that is a modified tape measure system described in the May 2007 QST article "Adapting a Three Element tape Measure Beam for Power Line Noise Hunting". As seen in the photo, I need to finish designing the adjustable hairpin matching component and the balun, then assemble. I plan to mark the tuned lengths with colored scribed lines so I can adjust to frequencies of interest quicker in the field. If you haven't already read into ways to salvage free electronics related components to upgrade your DEW Detection System for the cost of going to get... I added some images to this last step to provide inspiration in regards to what can be used that I salvaged mainly from some CRT's and VCR's. With some salvaged copper wire or copper pipe and some salvaged connectors and some other materials along with a free satellite dish, a more powerful DEW Detection System parabolic trough antenna can be made starting with a detecting element like shown in one of the many great videos by andrew mcneil who also has instructables to detail how to make various types of antennas. This is another spiral conical antenna designed for detecting lower frequencies that can be made from salvaged materials. Technically multiple dishes can be used on more advance mounts, like a Dobsonian mount or other designs and even to triangulate more effectively to make a synthetic aperture phased array. I've picked up a few free old TV yagi antennas for free from Craigslist with masts even and antenna rotators. I want to note also, that ferrite chokes on the USB extension cable or USB cable on both ends can reduce noise. There is a picture of one added and from my understanding you want this on the wire as close to the connector as possible. This will help filter the DC USB TTL signal from alternating current (AC) noise kind of like helping to prevent the USB cable from being an antenna also. Once you learn electronics more, you'll find that Kirchhoff's Rule can be applied to any part of an electronic circuit and you'll want to consider filtering and lengths more critically especially at higher frequencies. These filters components can be salvaged off of power supply cords and other cables. I've seen some wrap the cable around the cylinder cores lengthwise so the cable goes through the center of the core twice. This will filter more analog AC signal from interfering with the digital DC USB signal. I added an example of this use of ferrite chokes that are on a cord I just purchased from the Goodwill Store along with a aluminum heat sink laptop plate that has a lot of aluminum that can be used for heat sinks and even making an aluminum enclosure. To keep the RTL-SDR cool, since they tend to overheat and I fried my first one when using somewhere detecting over 1GHz, I salvaged computer video cards heat sinks that can be re-used and cut to size even to be re-purposed as chip heat sinks on your RTL-SDR or any SDR. I haven't measured the fan spectrum profile of the heat sinks with a fan... though keep in mind if not using a passive heat sink, the fan will make a signal. Technically, running the whole system on DC is best to remove AC signal sources that can be traced... though theoretically are not just extra noise sources... the AC signal sources could hide rogue DEW sources. Power supplies, especially the higher quality switch mode and plasma TV screens, have ferrite or iron core torroid inductors that can be rewound to be used as filters as noted in the intro section link. A directional coupler can also me made using the inductors. As I mentioned with two links in the intro section, using the RTL-SDR or SDR as a pan adapter or discriminator tap on old radios or scanners can improve the detection range and capabilities of your DEW Detection System. These can be found for free or purchased at a reasonable price as noted prior. The PRO-2006 is more famous for modifications and interfacing to a computer with books even written to detail how to modify and make a discriminator tap with the scanner itself on an older LW or AM radio. The same idea can be applied to the scanner with an RTL-SDR a discriminator tap as demonstrated in a previous link in the intro section. Old radios can also be salvaged for components like the tuning air gap variable capacitors. Even old rusty ones can be sand blasted or cleaned to repair the tuning capacitors and be used to tune a mag loop antenna, radio or other antenna tuner. 1. Monitoring of the person (target) human body internal resonance frequencies that are the typical vital signs monitored and do so in a wireless fashion. 2. Detect external perimeter signals in a directional way if the antenna or a/the perimeter antenna(s) is/are on a turret since I think those detection systems are better than Doppler methods. Technically, with more advanced software like GNU Radio Companion (GRC) and two SDR's, you can learn coding and make custom scripts in GRC to correlate microphone sounds with specific frequency ranges on peaks observed with the sound maybe using a Center of Gravity (CoG) algorithm. One SDR can be used with a discone or other broadband antenna for a background scan and the other directional antenna like a yagi or parabolic dish/trough can be used for finding where the correlated with sound RF comes from more intensely. Multiple SDR's can be used for scanning the largest frequency range for example with Spektrum and the other SDR's used for scanning specific smaller frequency ranges found for a faster more real time approach. Maybe you know coding in assembly, or C, and can create a faster operating custom application just for DEW Detection. Eventually you might find, if you enjoy electronic systems, that a real oscilloscope with a bandwidth of 1GHz and an FFT function can be effective for detecting. This oscilloscope can be used for building, testing and tuning your equipment and can be found used for under $400. Some systems like the TDS-744A can be modified to perform like a TDS-784A also. There are even deals sometimes on the TDS-820 series that go to 6GHz and TDS-8000 that go even higher. I do have an EMAC that I can try to make a system on also and see what that is like. Not sure how feasible... though I am sure there is a way using a Mac based system. I also have a Smart Phone with Android 2.2 and an Android Tablet with the 4.0 version of the software that can be used to make another instructable if there is interest. Single Board Computer (SBC), microcomputers or even microcontrollers can also be used to make more portable Detection Systems. These systems can use more modules than just the SDR. Modules like a frequency counter, OLED display, power meter and others can be utilized. Stay Healthy, Be Safe and Let's Detect DEW Signals. Again, please share and support this effort as well as encourage others to support this effort to make a healthier, safer, fair and well being World free from forensically clean malicious assaults with DEW's that can poison us or worse in non-consensual ways and means.